Learn more about what a skilled companion can do. Our skilled companions are dogs trained to work with an adult or child with a disability under the guidance of a facilitator. 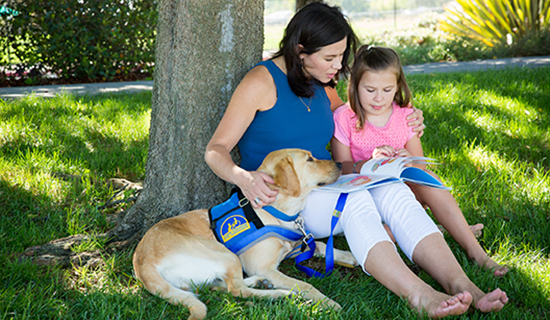 A facilitator is typically a parent, spouse or caregiver who handles and cares for the assistance dog, encourages a strong bond between the recipient and the skilled companion dog, and is responsible for the customized training needs of the dog. Disabilities served include, but are not limited to, cerebral palsy, muscular dystrophy, Spina Bifida and Spinal Muscular Atrophy. A Canine Companions skilled companion is bred to be calm, reliable, affectionate and utilizes its trained skills and tasks to help mitigate the recipient’s disability. A Canine Companions skilled companion can also serve as a tool to assist in developing independent living skills as well as integrated into structured therapies and utilized to facilitate social interactions. Not only can a skilled companion placement make their physical lives easier, it can boost confidence, feelings of self-sufficiency and responsibility. Canine Companions dogs are responsive, but NOT responsible. A Canine Companions dog cannot take responsibility for the safety of the recipient. A Canine Companions dog does not have the ability to identify a situation that is safe versus a situation that is dangerous. Canine Companions dogs are only able to perform under the direct supervision of an adult, and cannot go to school alone with a child. Canine Companions skilled companions and follow-up services are free of charge. The process to receive a Canine Companions assistance dog includes multiple steps. Click the button below to find out if an assistance dogs is right for you and start the process to receive more information. Please note: Canine Companions does not train or place dogs for the following; to do guide work for the blind, to do seizure or diabetic alert/response, to anticipate or detect medical symptoms, for the primary benefit of emotional comfort or social support, to recognize and/or manage undesirable human behavior, to provide supervision, navigation, or safety from environmental hazards, to respond aggressively, to provide personal protection, to assist with the management of mental illness as a primary condition.